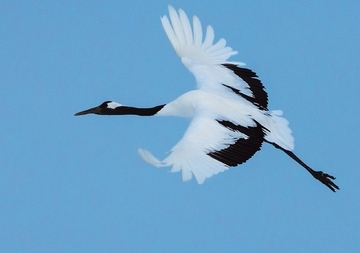 The Japanese crane (Grus japonensis), also called the red-crowned crane, is one of the world’s rarest cranes. It survives in two primary populations: one on the Japanese island of Hokkaido, and the other farther west, on the mainland of Asia straddling the China-Russia border. The Fred Astaire and Ginger Rogers of the avian world, these cranes are famous for their graceful courtship dances full of elaborate leaps, calls, and bows. Once they meet their perfect match they are faithful partners, remaining monogamous for life.